So, it's been way too long since I did a proper update here. However, I am wearing the t-shirt today. Did you see it? Untill I can sit down and do a full update from our trip to the mountains, here is a photo of Hannah having fun on the beach from July. Pizza Hut Australia's Latest Monstrosity - Cheeseburger Stuffed Crust! As most of you know, I lived in Australia for about three years from 2007 to 2010. During that time we quickly learned that pizza in Australia is not very good. The focus is on the toppings. Pile as many toppings on as you can while ignoring the quality of the crust or sauce. We ordered from Pizza Hut a few times and it was ok. I still get their spam emails and lately, they've been scaring me. 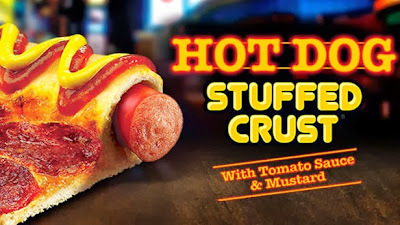 That's right...they stuffed the crust with hot dogs. This one actually surprised me a bit because hot dogs aren't actually a big thing in Australia. They lean more towards actual sausages instead. I checked with my Aussie friends and they all agreed that this was a bit much. None of them had any plans to try this freak of nature. Cheeseburgers. In. The crust. Why? How? Who on earth would ever want this? I keep hearing the line from Jeff Goldblum's character in Jurassic Park in my head: "Your scientists were so preoccupied with whether or not they could that they didn't stop to think if they should." This is clearly a case of something that shoudln't have been created. There are some other blogs out there breaking down the pretty obvious nutritional hazzards of this mutation. No need to go into that here. The part about these two horrifying "pizzas" that cracks me up the most is the fact that Aussies think of Americans as overweight, gluttonous slobs. They claim that we are all fat and that our portions are too big. At least we didn't unleash this frankenfood on the world, though I fear that it may invade the US by this summer. We just keep getting closer and closer to Taco Town. I can't believe that I never shared this last year. Each year my company has a costume contest for Halloween. I decided to go all-out and grow and bleach my hair (and goatee!) and go as Guy Fieri from the Food Network. I'm proud to say that I won the contest. What do I have planned for Halloween this year? Check back in a few weeks for the photos! It is very common for us to see deer in the open area outside of our fence in the back yard. I have never, however, seen one decide to curl up and take a break like this. While taking photos of my daughter in the back yard of my in-laws house in Pinehurst, NC this little hummingbird flew by for a snack. This past weekend Mrs. MattDoc participated in the Color Vibe 5k race. Naturally I had my camera with me. Here, participants are blasted with a color cannon right as they start the race. I may be late to the game here, but I only just discovered the Auto Awesome features of Google + Photos (this is mainly because I've been trying to still use Picasa albums instead of +). Some cool features though, including the one that will create an animated gif of photos that it detects are part of a series. It does an ok job, but sometimes misses some. I would rather this just be a feature where I could feed it 5+ photos and have it make the animation for me. Here's one that I made last night. We recently purchased a new bubble machine and noticed that there was some paperwork in the box for a photo contest. So...we entered this photo. Please do me a favor and go vote for it every day. You don't have to register or provide any info at all. It's just one click. Vote here. I have realized that about 97% of the photos I take these days are of Hannah, my daughter. I have already shared the majority of my non-Hannah photos taken over the years during my travels. This being the case, most of what you'll probably see here are some of the best shots I get of Hannah as she grows up. I still think they are good photographs. They'll just be of one subject. Hope you enjoy.